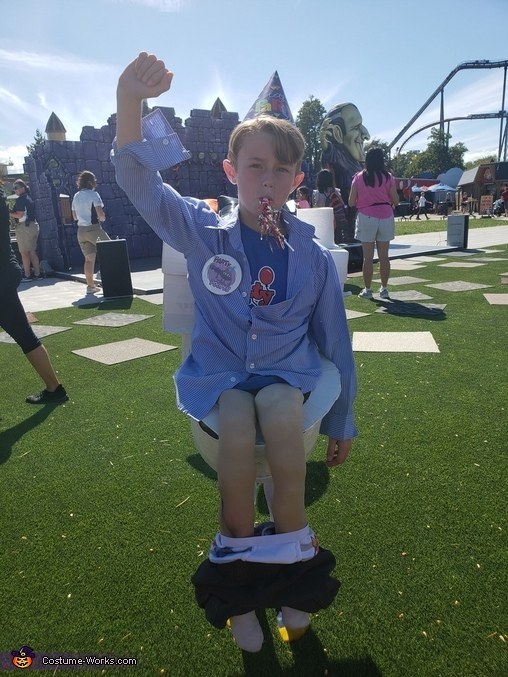 Gavin is a typical 8 year old boy who loves to talk about poop. This year he wanted a funny costume so by using a couple of boxes and a cut down laundry basket from the dollar tree I got to work. I covered everything in white duct tape and assembled together with zip ties. The costume is held on by suspenders threaded through slits in the box. I stuffed a pair of old dance tights for the legs and used outgrown pants, socks, and underwear to dress his fake legs. Finally I attached a roll of toilet paper and a handle for flushing. He loves his costume and it fits his sense of humor well.